This year’s spring LINK2job employment fair was held on Friday, May 4, at the Metropol Palace. 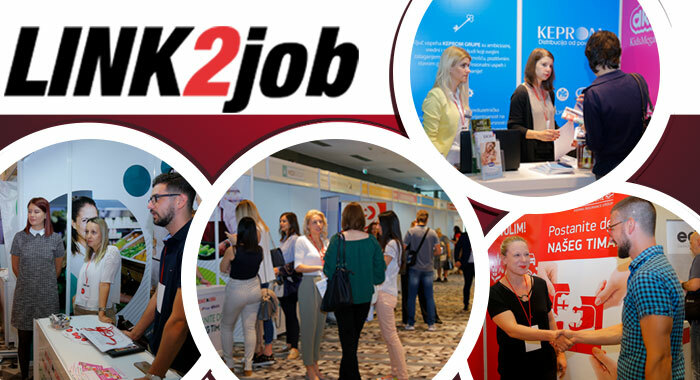 The fair was traditionally organized by the Center for Career Development, with support from the City of Belgrade and the National Employment Service (NES). This year’s spring fair generated great interest among the visitors – more than 5,000 people came to explore the excellent business opportunities and apply for more than 300 vacancies. The fair was opened by Dragomir Petronijević, a member of the City Council and the president of the Council for Employment and Economic Development of Belgrade, deputy director of NES’s Belgrade branch Siniša Knežević, as well as representatives from LINK group. Petronijević said that the fair is an important event, and that the number of unemployed people in Belgrade decreases each year. Currently, there are around 84,000 unemployed people in Belgrade, which reflects a constant decrease in the unemployment rate. There are also more paid internships, which is a new thing, as the companies fighting for manpower have, with our help, designed a system whereby a year-long paid internship provides you with the necessary skills and a chance to prove yourself. In Serbia, we are creating an environment in which young and creative people will find a place in their hometown, secure a job a stay in their country. More than 40 companies participated in the fair, offering many interesting vacancies. An important segment of the fair were the lectures given by people who had the courage and ability to launch their own business. They gave useful advice to all those who wish to embark on the same journey. This part of the event generated great interest among the numerous fairgoers who attended the lectures. Among the people who conveyed their experiences were Sandra Savanović, a lecturer at BusinessAcademy, Nina Zukanović, director of sales and marketing at Crofnas, and Manja Gvozdenović, who turned her talent for drawing into a profitable job by creating a company called ManjaDesign. The lecturers used their examples to explain that nothing is impossible if you have enough willpower, knowledge and tenacity to develop a business you believe in. At this year’s LINK2job employment fair, the fairgoers were traditionally very interested in the free English and ECDL courses. All the attendees were able to apply and receive a free online course of their choice. Throughout the fair, the candidates attended many useful workshops designed to help them boost their self-confidence and enhance their skills for their next job interview. Thanks to the ITAcademy DesignStudio, all interested attendees received a professional photo for their CV. What made the visit to the fair a unique experience was the fact that the attendees could visit the Job Box, the Laptop Corner and the Social Network Corner, where they could get first-hand experience from HR professionals, participate in a job interview simulation, and receive useful advice on how to improve their performance and use modern technology to follow and apply for vacancies. This LINK2job employment fair was a unique opportunity for all unemployed people to try to find employment in large corporations, such as Comtrade, Sitel and Nelt, to name but a few. The next fair is scheduled for the fall of 2018.